Tales from the lakes, rivers and streams. 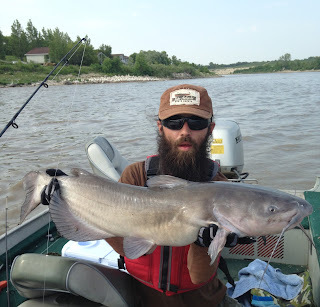 The term world class fishing gets thrown around a lot, in Manitoba I would say we have quite a few world class fisheries. A few examples being; Lake Winnipeg in winter provides a serious chance at multiple Walleye over 28 inches in one day, many pot hole lakes in the Duck Mountains can give you a trout of a life time and then there is the Red River. 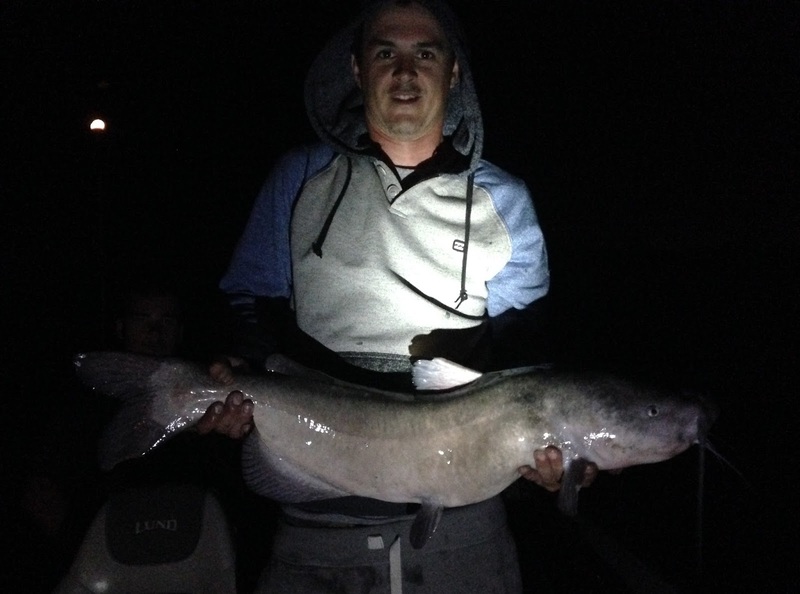 Prime Walleye fishing in fall, great carp fishing in spring and to top it all off the catfishing can be superb from season opener until almost October. The Lockport area on the Red River (a few kms south of Selkirk) probably has the largest concentration of big Channel Catfish in the world. We know catfish can travel far distances and are all over the river, but if you want a chance at multiple cats over 30 inches this is the place for you. 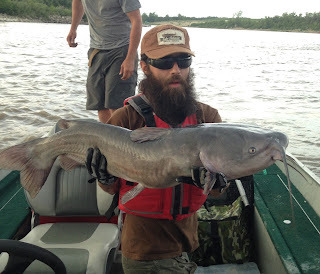 The shorelines can be packed and at times the current almost unfishable but from a boat your chances of hooking and landing a big kitty greatly increase. It's been hot, rainy, windy and smoky with extreme weather warnings more often than not this summer. 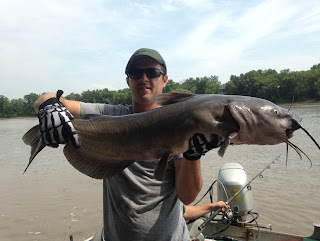 We had been planning a trip for catfish for a while now and we almost had enough bait. The preferred bait of choice for cats can change throughout the seasons (or day) so we always like to go prepared. Goldeye and suckers were caught earlier in the week, shrimp bought from the store, a few boilies baked by Frodo and bright and early the morning of the trip we caught some creek chubs. 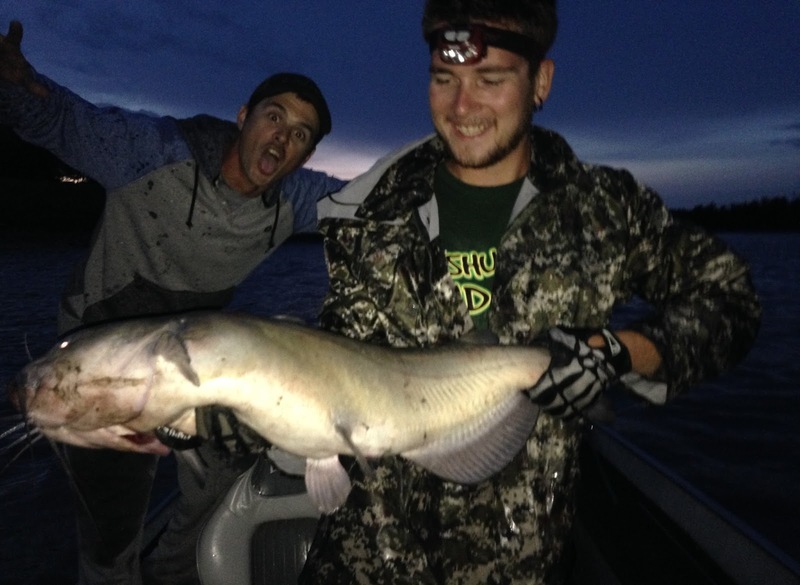 We aimed to fish from noon to midnight from the boat and a rodeo going on at the Selkirk Park meant the park staying open all night instead of closing at 11, so besides a thunderstorm or running out of bait nothing could stop us. After about 2 hours of driving and $25 each in an envelope for the biggest fish by the end of the day, we were at Selkirk Park just after lunch. We quickly prepped the boat for launching and were on the water. We decided to try and find a few spots that might hold some fish on our way down to the Lockport area so we cruised south from the launch at a slow pace keeping an eye on the fish finder screen looking for structure and marks. We eventually came up to a hole that seemed to be holding a few fish after a mudflat so we decided to anchor up and give it a shot. I began with a slip rig but found the current a little strong and it was quickly evident that a 3 way rig would be a better choice especially after Jay landed the first fish at 35.75 inches long. It was a slow start but a good one! Each spot we stopped at produced one or 2 cats within 30 minutes or so but we were looking for better numbers and hopefully even bigger kitties. So we decided to try our luck near the locks and work our way back down river if needed. The current was even stronger here and we were able to anchor up near a slight transition from 14 to 17 feet. The water around Lockport is so full of debris that you really cant see much on your fish finder except the depth, but the breaches everywhere let you know there are still fish around. Within two minutes of wetting a line Frodo had a fish on running straight to heavy current and peeling line off his reel. 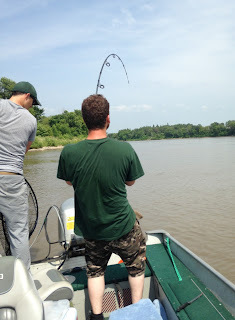 Our strategy when someone had a fish on was to reel in as quickly as possible to get all lines out of the way and one person focus on netting while the other not fighting a fish helps to stabilize the weight in the boat especially if other boats rip by. Fighting these big brutes is tough enough but when you add the strong current and wake of a boat passing by things can get agonizing. We were fishing a current seam and the cats would head to the stronger current as soon as they realized they were hooked. After about 4 minutes of fight the fish was in the net and Frodo on the board with a 34 incher. I couldn't get my bait back out there fast enough and it wasn't long after my weight settled when a catfish absolutely slammed my creek chub. The fish stormed down stream with line peeling off on a huge run, after carefully tightening the drag I began trying to win some line back when the fish began to charge back upstream. Reeling as fast as I could I soon felt the weight of the fish again and so began a tug of war of sorts trying to get it up near the boat. Once near the surface it thrashed and rolled ( I would lose my biggest of the day later on with the fish doing this) and did it's best to shake the hook, but the 7/0 octopus hook wasn't going anywhere. 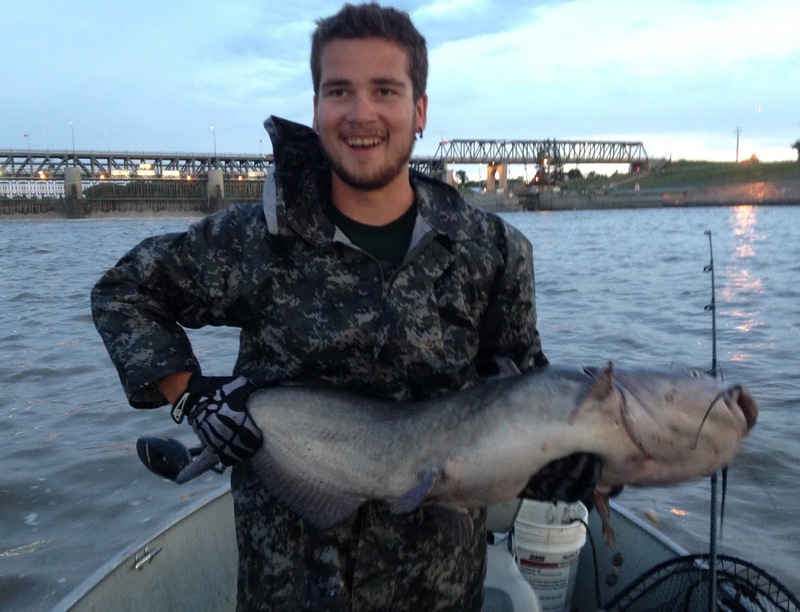 After another ninety seconds or so of grueling lifts and pulls it was finally in the net. 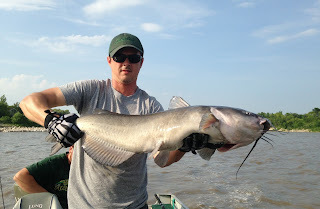 We were able to land nine catfish at this spot from 31 to 35 inches all putting up remarkable fights and really testing our tackle. A few fish were lost and one broke off, we were using 30 lbs mono line and leaders and we were really shocked to see that happen. ( I plan on using braid next time and a flouro leader both of higher pound test ) Once the bite had noticeably slowed down we would pull up anchor and reposition ourselves near by and try again. This paid off each time with the bite picking up and steady action right off the hop. 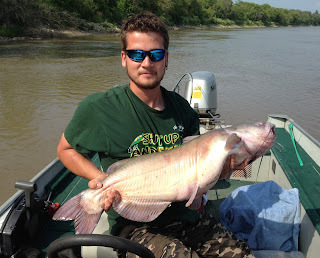 After a grueling ten minute fight I was able to bring aboard a 36 incher and biggest fish of the day so far. Each time it was near the boat it would storm off with pure power as if this wasn't its first rodeo. I was exhausted after that fight and took a ten minute breather during which Frodo landed another nice one. Part of what makes this catfishing world class up around Lockport is Manitoba's regulations regarding catfish. None over 24 inches can be kept so the bigger ones are protected, and there is a good chance most big channels in the area have had a hook in their mouths in the past. There have also been tagging programs with a few different organizations and some channel catfish tagged at Lockport have been caught many hundreds of kilometers away from where they were tagged. The evening was growing near and a light rain was upon us, but we weren't deterred. As long as the lightening in the distance stayed far enough away we were going to keep at it and that we did. Fish after fish to the boat we were starting to agree that we would just stay until they quit biting or we ran out of bait. As dusk was getting near Frodo hooked into something big that he could barely move and after a few minutes it broke off. Frustration was evident as we had all lost one or two nice ones but we were learning and hammering fish so it never lasted for long. The smile below is evident of how quickly the disappointment of the one that got away can fade. 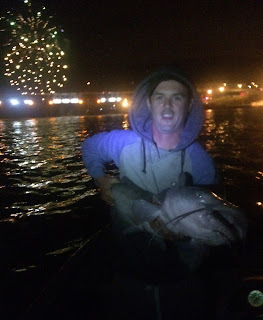 As darkness crept in the bite picked up even more and Frodo managed to beat my 36 incher by a quarter of an inch putting him in top spot for the purse. He was also outfishing us I might add. (I can only hope he was as sore as I was the next day) It turned out there was a festival going on in Lockport and sometime after it was dark some professional fireworks started going off. Jay commented that this was probably going to kill the bite and before he could finish that sentence he had a fish on. Fireworks rocketed off in the background as he fought another brute, a celebration of all the days success went on long after it was landed, measured, photographed and released. The loud bangs did not deter the cats as they continued to bite for another hour and a half. We stayed well past midnight and had an adventurous ride back down the river to the launch in the darkness. Satisfied, exhausted and hungry, already thinking of the next trip back to the Red River of the North and its trophy Catfish fishery.